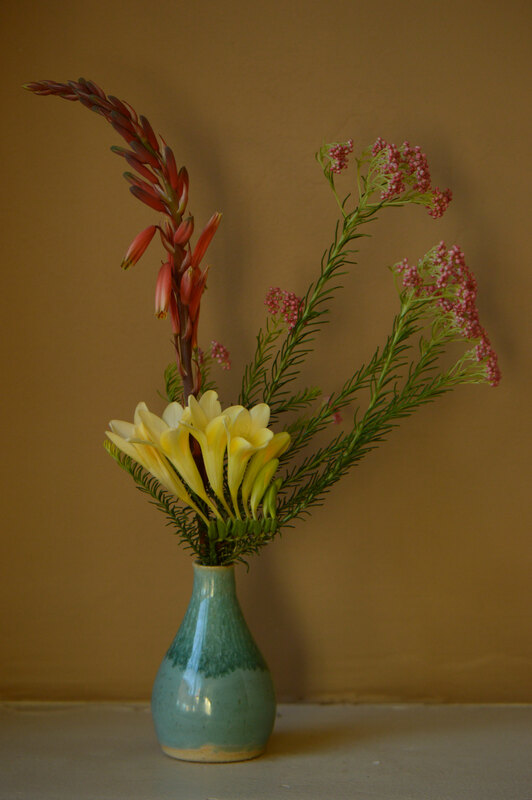 Today's vase was kept quite simple in order to avoid overwhelming any of the precious flowers. They went into the smallest of my vases, the little blue handthrown bud vase. After yesterday's post, it was certain that one component of today's vase would be Freesia alba. Only one stem because I couldn't bear to cut any more. They are so luscious in the garden! 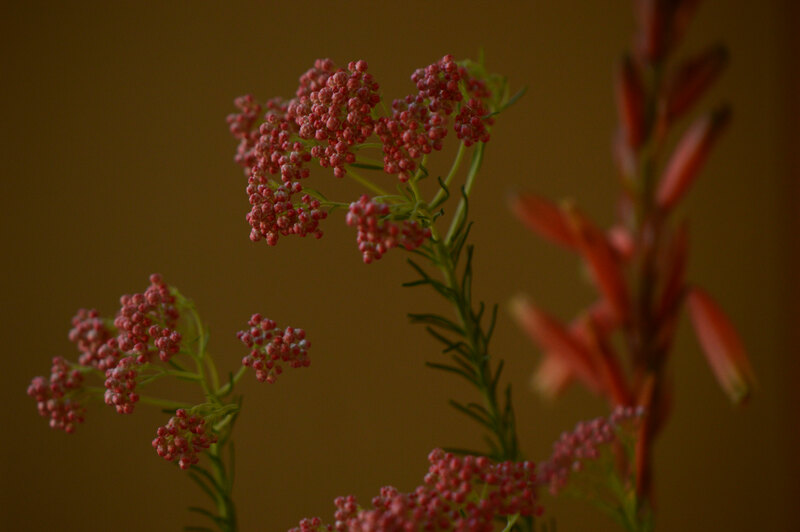 Buds are forming at last on Ozothamnus diosmifolius, which I bought partially for its readily dried flowers. I learned last year to cut the stems earlier rather than later. 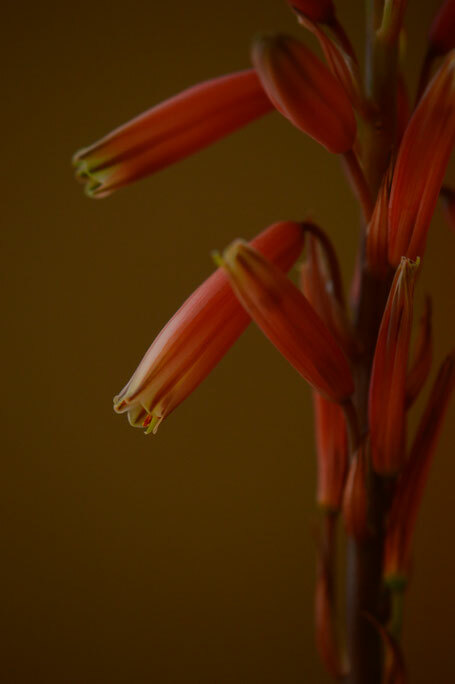 While the fully open flowers are pretty, they do not dry quite as attractively as the buds. The former become rather faded and furry; the latter keep a soft pink color and remain firm. 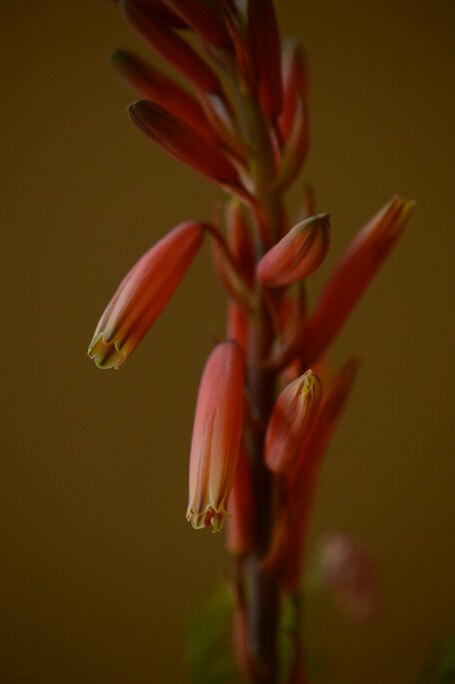 With cream and warm pink, the rosy orange hues of Aloe "Blue Elf" seemed just right. And it has plenty of flowering stems! It is the first aloe to come into bloom so far. It's a very elegant plant in its way, worthy of being displyed next to the freesias.. Thanks, as always, to Cathy for developing and hosting the lovely In a Vase on Monday, where gardeners from over the world bring a bit of the garden's richness indoors! I linked back to your previous post in hopes of guessing the family (always a fun challenge), but had to resort to wikipedia ... Iridaceae! Neat surprise. A few glimpses of the leaves in your previous post do look iris-like, but the flowers fooled me. 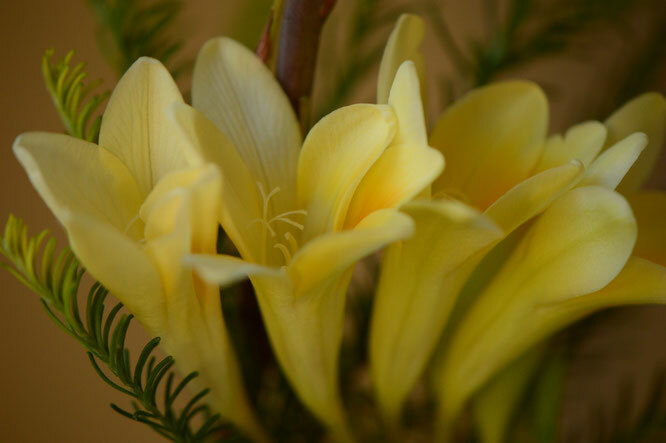 The advantage of cutting Freesias is that you have that wonderful scent indoors! 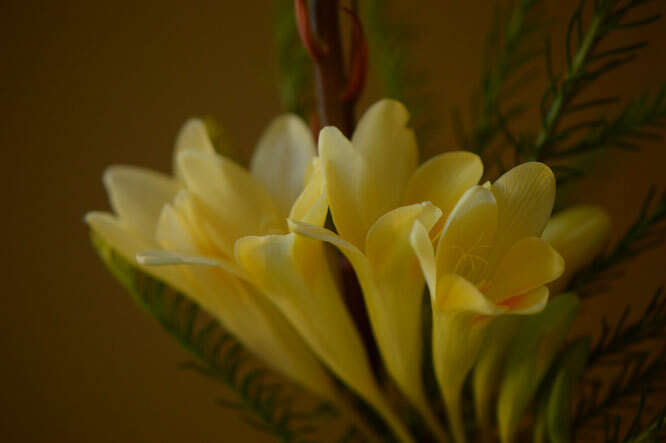 :) I love the echo of the shapes of both the Freesia and the Ozothamnus. The Ozothamnus is new to me and reminds me of Statice, but a different colour. Beautiful vase too Amy! 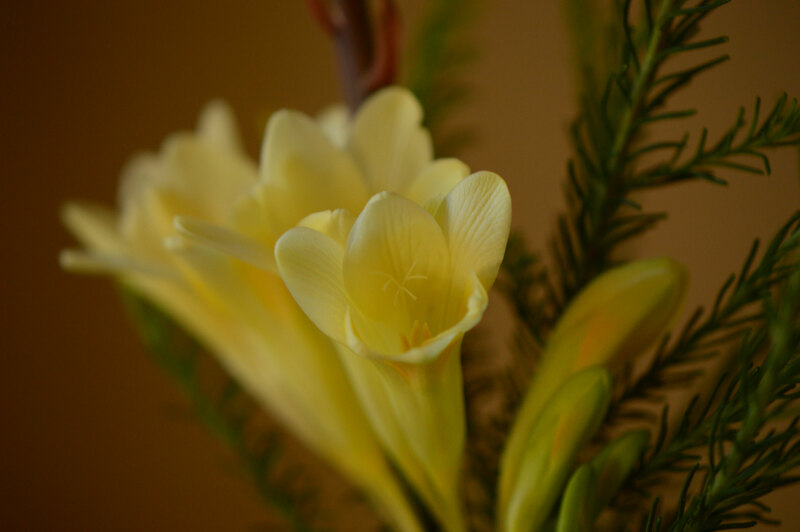 Your freesias are more or less the same creamy white as my tulips, and the dried Ozothamnus in particular works so well with it. Thank you for sharing your precious blooms! Hollis - Yes, the leaves are iris family leaves :) These grow so low to the ground that I hardly notice the foliage. I need to take a ruler out to check the size; they seem about the same size or slightly taller than Dutch crocus. Cathy@Rambling in the Garden - I get far more good out of cutting the ones that can be cut ;-) I love those creamy white/yellow tones...! Love the lines of your arrangement - elegantly wistful. What a beautifully scrumptious grouping to enjoy inside! My freesias are in pots, so I bring one in, when it is happily filled with flowers. lazy gardener. Mine are neglected in pots. It is on my guilty gardener list to sort out all those pots of lost label bulbs.